While the landmarking of 1 Chase Manhattan Plaza is being considered, the already landmarked Liberty Tower across the street is getting an exterior rehabilitation. Often overlooked and now hidden among much larger buildings, Liberty Tower was a skyscraper when it was built in 1909. 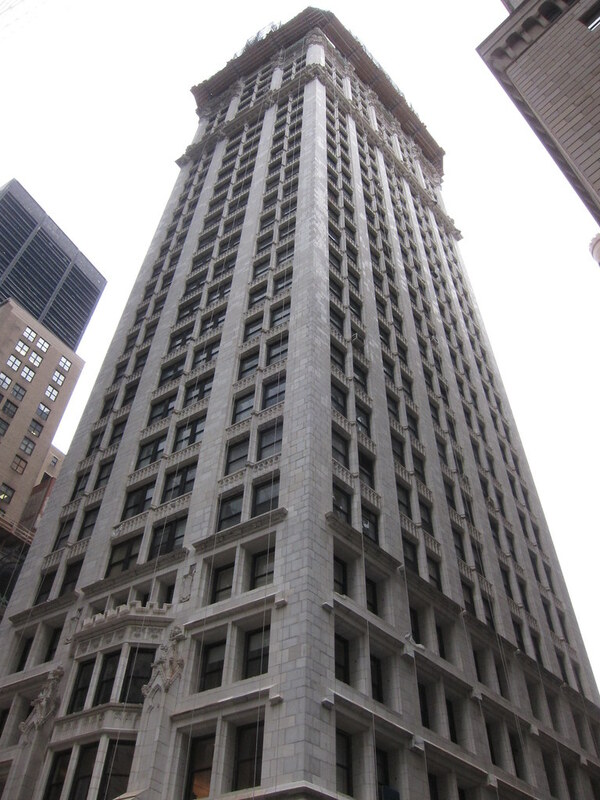 It survived many changes in ownership, and although it became outdated as an office building, it didn't suffer the fate of its contemporary, the Singer Building, probably because the landmarked Chamber of Commerce building next door precluded assembling a large site. So after Sinclair Oil (it was known as the Sinclair Building at that time) moved out, it continued as a commercial building until 1979, when it became one of the first residential conversions in the Financial District. great building. thanks for the news and pics, Zippy. I can't believe I missed this. Absolutely beautiful architecture. I've always really liked this building. I'm not sure about living in it, located where it is, though. I imagine it being eerily quiet and almost last-person-on- earth-like on weekends when venturing out. But having lower Manhattan all to myself for a day, now there's a nice daydream. Thank you for sharing your photos, Zippy. Seen below, the 2BR, 2BA penthouse at 55 Liberty Street, the entire top floor of a landmark co-op building. Things get a little tight up near the crown of the building, which gives the walls a certain folding-in-on-you charm. The $1.2 million listing has lingered on the market for seven months, six since a $99K price cut. Perhaps one hint as to why: that $3,126 monthly maintenance. Floorpleezy after the jump. HERE'S TO ANOTHER 100 The exterior sculptures and terra-cotta blocks of the 1910 Liberty Tower were restored or replaced in a two-year project. IT’S a big birthday for a co-op with an eventful history. Liberty Tower, a 33-story neo-Gothic skyscraper adorned with terra-cotta gargoyles, birds, alligators and flowers, is celebrating not only its 100th year but also the completion of a $5 million repair job on its facade, which was damaged by the 2001 collapse of the nearby World Trade Center. It was built in 1909-10 as office space and converted to a residential co-op 32 years ago. The building’s architect was Henry Ives Cobb, who also designed other early skyscrapers. The slender tower was designated a city landmark in 1982 and added to the National Register of Historic Places a year later. At the time of its completion in early 1910, it was one of only a handful of skyscrapers. Located at 55 Liberty Street in the financial district, Liberty Tower soon found its sight line to the Statue of Liberty eclipsed by newer, taller glass-and-steel structures. Its proximity to ground zero was eventually to deal it a harsher blow. 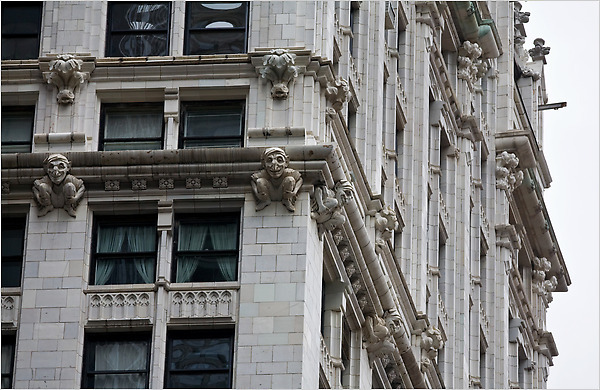 The building owes a great deal of its charm — and at least part of its post-9/11 woes — to its cream-colored exterior of terra-cotta blocks affixed to a steel frame by metal anchors. While the facade was already suffering from sloppy past repairs, corrosion of its steel frame and deferred maintenance, “the unusually severe seismic events of Sept. 11, 2001” appeared to have caused significant additional damage, LZA Technology, a structural engineering consulting firm hired by building management, concluded in a September 2003 report. The damage let in water, rusting the steel underneath. The steel expanded as it rusted, enlarging the cracks and threatening eventually to loosen the blocks. It soon became clear that extensive and costly repairs to the exterior would be needed, for which neither city nor other government money was available. The building’s board voted unanimously to go beyond mere repairs and restore the facade to its original state. The estimated cost far outstripped the building’s reserves, although a $450,000 insurance settlement helped. Shareholders had to come up with about $4.6 million. The average cost for each of Liberty Tower’s 86 apartments worked out to roughly $54,000. Residents were given the choice of paying their share up front or over five years, and about half went for each option, Eric Aboaf, the co-op treasurer, said in a recent interview. In the two-year restoration, completed in December, 202 exterior sculptures and about 3,200 terra-cotta blocks were replaced or restored. An additional 1,040 blocks underwent lesser repairs, said Sahr MuhammedAlly, the co-op president. The building’s striking Gothic style, the centuries-old inspiration for cathedral spires that reach into the sky to approach the divine, is central to the tower’s romantic appeal. “That America in 1909 would take this medieval idea and match it up with a skyscraper that went up 33 stories is a wonderful combination,” Mr. Lombardi said. It was built by the Liberty-Nassau Building Company as a speculative office building, according to the Landmarks Preservation Commission. It was at first called the Bryant Building, the name of the seven-story building that had occupied the site and which served from 1853 to 1875 as home to The New York Evening Post, whose editor at the time was William Cullen Bryant. Mr. Lombardi, a pioneer in the conversion of commercial buildings into loftlike residential properties, acquired the building in 1978 for about $1 million and sold units as raw space. Today, listings at Liberty Tower include a two-bedroom offered by the Corcoran Group for $925,000. A four-bedroom triplex with 37 windows and three exposures, listed by Brown Harris Stevens for $2.95 million, is scheduled to go on the market this week. They continue to do exterior work on this building. It's very attractive, but I look forward to them wrapping and not having so much scaffolding around. Finally went to Pound and Pence Thursday, and it was really nice.